Fifteen years later, Josie and Meredith are in their late thirties, following very different paths. Josie, a first grade teacher, is single—and this close to swearing off dating for good. What she wants more than the right guy, however, is to become a mother—a feeling that is heightened when her ex-boyfriend's daughter ends up in her class. Determined to have the future she's always wanted, Josie decides to take matters into her own hands. On the outside, Meredith is the model daughter with the perfect life. A successful attorney, she's married to a wonderful man, and together they're raising a beautiful four-year-old daughter. Yet lately, Meredith feels dissatisfied and restless, secretly wondering if she chose the life that was expected of her rather than the one she truly desired. This novel really dug under my skin and I felt like the characters were my family members by the time it ended. I loved the very realistic portrayal of tragedy in this family, and I loved the timeline it was written in. Giffin did a fantastic job of keeping us in the present while letting us see what had happened fifteen years prior. It seemed that everyone involved felt partially responsible, which was heartbreaking, and made me want to reach out and talk to them. The detail that went into characters made them all the more realistic and intriguing. The constant pull and tug between Meredith and Josie wanting to be a bit more like the other was really marvellous to watch. I loved Gabe and I loved the way his girlfriend interacted with him and Josie. I loved Nolan and the way he seemed so unchanging. All the minor characters, too, from an almost forgotten ex to a fertility doctor, were really beautifully written. I felt that the ending was basically perfect, leaving strands open and closing the ones that really mattered. Nothing felt entirely forced, but there were plenty of opportunities for characters to move forward. 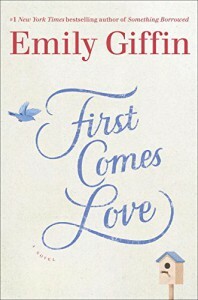 This book questioned the difference between loving someone and being in love with them, and the effect that losing someone at a young age can have on one's emotional maturity. While it focused on the relationship between the sisters, it also touched on friendship--platonic and romantic--and the random ties that can keep a mother in touch with a girl she barely knew. Children also played a humongous role in this book--both sisters were quite maternal in their own different ways. Seeing Harper interacting with different adults was enlightening, and Josie's complete drive towards having a child was really passionate and fascinating as I couldn't relate. I'd barely call this a love story, though it did have a lovely romantic subplot that kept me happy. This touched on so much more than love, and I highly recommend it.